Original pat. Pending strat saddles. Worth????? Discussion in 'Guitars in General' started by mikee1, Feb 8, 2012. I just bought a strat that someone made am ok attempt at recreating a '62 oly white strat. Well after getting it out of the box and looking it over I see that the saddles are obviously not right for the bridge. It had a narrow bridge plate and reg size saddles. 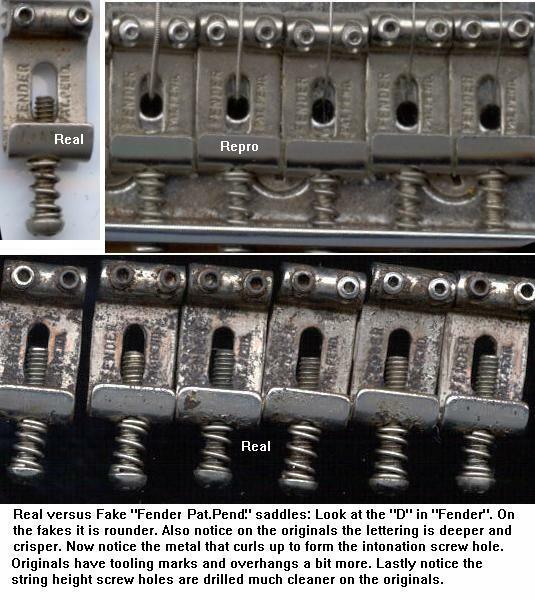 Closer inspection I realize they appear to be original pat pending strat saddles. I have no way of telling, if there is any, what year they are and I really know nothing about them. Soooo, the question is, what can you guys tell me about them? I have no way of posting pics but I can tell you they look identical to a set on ebay thatb are se.lling for an outrageous amt of money. I know they look different than any other modern ones ive seen in that they look to be mafe from a thinner metal. Anyway, what do you guys think? What are the rral deal worth? $.00 IMO. Thats what they're worth to me at least. They are the only saddles i ever felt were horrible sounding in that they had a nasty spikey high end. That was maybe 6-8 years ago. Recently i put them on yet another strat thinking maybe it was a fluke or my memory wasn't good. But same thing. I'd give them to you except i tossed them right then and there. Why anyone would want them is beyond me. I assume you're talking about fender USA vintage saddles. I'd put MIM saddles or any other before i'd use those again. Even the wrong size is better than those. If you are saying they are true originals off an early strat...well, there are people who'll pay a fortune for a vintage pickguard screw. Did you win it for 512$ off ebay? Willing to bet my nuts that the saddles aren't legit. There are multiple sources of repros out there, some being ok to some being dead on. JThat's exactly what I did! I put some MIM bent steels on there but only because they are what actually fit the bridge on the guitar. I haven't yet strung her back up yet to see what she sounds like now. I also had to change the pots and switch too so I won't be able to tell a difference in the saddled alone. Even with the saddles being too big it was set up great and I hated to take it apart but I'll get it back better than it came. I'm just curious about the saddles because like I said I've seen them for sale for craxy amounts of cash. I was told these were the real deal by the mom and pop shop nearby but like you said some reproductions are dead on so I don't know what to think. I was just wondering what a set of real ones could actually be sold for. At a reasonable price for both parties. 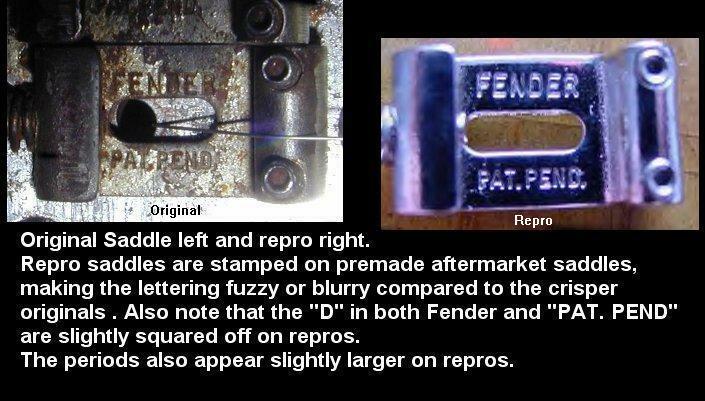 Unless you know for a fact that they came off a vintage guitar I'd be willing to bet they are repros. I have the monster relic repros myself on my partscaster, actually. I could probably sell them as "possible vintage" and make a profit, but I couldn't stand for that. If it's a recent partscaster I'd say the chances of them being real are minute. If it's from a time where these weren't considered that valuable, there is a chance that they might be legit. There are numerous sources for repros that are really hard to distinguish from the real thing, which means it's up to you to prove that they are real. Unless you know their history I'd say it's nigh impossible to tell. You could probably sell them for a decent amount on Ebay anyway, as there are probably a bunch of vintage crazed people who are willing to take the risk. I wouldn't do it myself though. Did you pay a large premium for the saddles when you bought it? If not, it's safe to assume that they didn't know whether they were real. I totally agree with you that morally I couldn't do it either. The local shop owner is interested but I couldn't tell him a price that I felt good about because I don't know for sure if they are real or not. Again your correct in that I could list them as"maybe real" on ebay and still make agood amt from someone but not even sure if I could do that not knowing for sure the history. the local guy does me really good business wise and I refuse to screw him on a deal or let him screw himself no matter how much he wants me to. Hence the reason for this thread. Asking the previous owner where he got them from strikes me as the simplest thing to do. Real ones have deep lines in the same spots along that bent lip the intonation screw goes into. There is a place that does them now ($125 a set), but the far majority do not have them. In the past they were stamped on blank pre-made aftermarket saddles. Look for the straight lines ontop and underneath the saddles. Very few of the repros have these, but all of the legit ones have them. If your saddles don't have these, case closed.